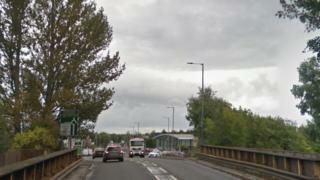 Plans to replace Stirling's Kerse Road Bridge as part of the electrification of the area's rail network have been approved by councillors. Network Rail's proposal would lead to the closure of the bridge for six months, and not a year as it originally planned. The existing bridge will be replaced to meet clearance distances needed for the line's electrification. The programme of work could begin next year. If agreed, it would avoid closing the route during the 2017 and 2018 Christmas trading periods. The application was approved at a meeting of Stirling Council's planning and regulation panel. Panel members said that the council would work alongside Network Rail to "ensure the short-term impacts are minimised as far as possible." Network Rail's programme of works, as well as road closures and traffic control measures, will be considered by the council's environment and housing committee.